The long-term sulfur cycle is depicted as a panorama in figure 6.1. Sulfate is added to the oceans, via rivers, originating from the oxidative weathering of pyrite (FeS2) and the dissolution of calcium sulfate minerals (gypsum and anhydrite) on the continents. Volcanic, metamorphic/ hydrothermal, and diagenetic reactions add reduced sulfur to the oceans and atmosphere where it is oxidized to sulfate. Sulfur is removed from the oceans mainly via formation of sedimentary pyrite and calcium sulfate. Removal also occurs at mid-ocean rises (not shown) via hydrothermal pyrite and CaSO4 formation, but the pyrite formation is small relative to that forming in sediments, and the CaSO4 is mostly subsequently redissolved (see discussion below). 1. Ebelmen was one of the first to use the new chemical symbolism of Berzelius, which has been used ever since, but his reactions were written in terms of 30 O instead of 15 O2 because the oxygen molecule had not yet been discovered. Figure 6.1. The long-term sulfur cycle. Downward pointing arrows associated with O2 signify O2 consumption; upward pointing arrows signify O2 production. The sum of these reactions is the same as reaction (6.2). 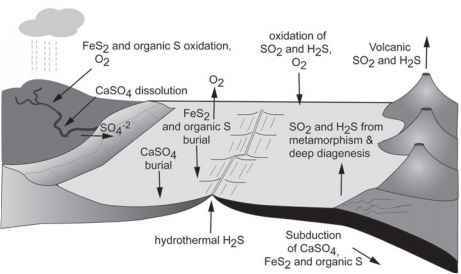 Reaction (6.7) represents burial of photosynthetic carbon in sediments, reaction (6.8) is bacterial sulfate reduction, reaction (6.9) is sedimentary pyrite formation, and reaction (6.10) is the neutralization of bicarbonate. For further details on the overall process of sedimentary pyrite formation, consult Morse et al. (1987). Reaction (6.11) represents the dissolution of gypsum and anhydrite in sedimentary rocks during continental weathering, whereas reaction (6.12) represents the precipitation and burial of these same minerals in sediments deposited in evaporite basins. Since evaporitic sedimentary rocks occur sporadically throughout the geologic record, it is likely that removal fluxes from the ocean via CaSO4 formation are often unbalanced relative to addition fluxes from weathering (Berner and Berner, 1996), leading to non-steady-state levels of sulfate in seawater on a million-year time scale. Tectonic processes involving sulfur, as major controls on atmospheric O2, have been emphasized by Walker (1986) and by Hansen and Wallmann (2003). This includes emission of reduced sulfur-containing gases during volcanism and hydrothermal reactions at mid-ocean spreading centers (figure 6.1). According to Hansen and Wallmann, reactions at the spreading centers are complex and involve CaSO4 precipitation and later dissolution, reduction of seawater sulfate by reaction with Fe+2 in basalt with the formation of hydrothermal pyrite, and oxidation of primary sulfides and H2S derived from the mantle. The overall net effect of these pocesses is the consumption of atmospheric O2. The quantitative importance of sulfur reactions occurring at mid-ocean spreading centers has been questioned by Berner et al. (2003). First of all, the fluxes calculated by Hansen and Wallmann (2003) depend strongly on calculations of the rate of water flow through the mid-ocean rises and how it has changed with time, which is a controversial subject (Edmond et al., 1979; Morton and Sleep, 1985; Kadko, 1996; Rowley, 2002). Second, the most important process, hydrothermal CaSO4 precipitation, is essentially balanced by later dissolution of the CaSO4. Third, the sulfur isotopic composition of H2S emitted at ridge hydrothermal vents indicates that more than 80% of the sulfur is derived from the mantle and not from the reduction of seawater sulfate. 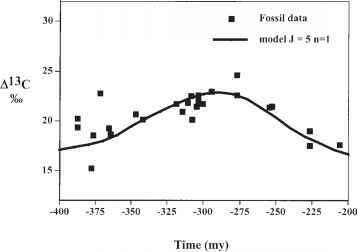 Finally, oxidation of Fe+2 minerals in basalt by the reduction of seawater sulfate results in an irreversible atmospheric oxygen drop over long times (Petsch, 1999). How much CaSO4 is there in seawater?